Body image concerns are not confined to the catwalk or the dance floor. Indeed, it is important to note that body concerns are everywhere, including on the ski slope. Whilst studies have shown than sports help to foster an individual’s self esteem, improving their confidence and helping them to build a positive relationship with their body, many skiers, particularly beginners, often worry about their appearance on piste. So, what can be done about it? Skiers with a shaky self image can benefit from taking time to choose ski wear that suits them, from gaining an appreciation for the athleticism of the sport and from taking time to unwind, escape and enjoy the relaxing sensations that skiing brings. Even the most glamorous of individuals worry about their looks when away on a ski break. Bulky salopettes, chapped lips and sore muscles do not do much for the self confidence. By preparing for your ski trip and taking time to find ski wear that suits you, your time on the slopes can become an opportunity to experiment. 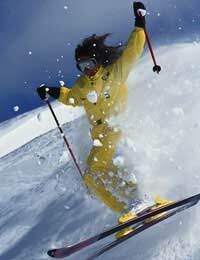 Take care to find a ski suit that fits you well. Don’t be tempted to hide in a salopette a couple of sizes up, as it will swap your frame, adding bulk. If you’re feeling brave, opt for a bold, bright colour that compliments your skin tone and excites your imagination. Invest in a pair of sunglasses that suit your face shape. Be sure to purchase and pack all the things that you will need to take care of yourself both on and off the slope. Sunscreen and an SPF lip balm are both musts. Women who are feeling adventurous, might like to opt for a luxurious moisturising lipstick with built in SPF. Moisturiser, bath oil and your favourite candles can help you to relax at the end of the day. Muscle rub is also advisable. Remember that being prepared and taking time to yourself will boost your confidence. Those with poor body image tend to work against, rather than with, their bodies, with many describing their relationship with their physical selves in terms of struggle and battle. Skiing, along with other forms of exercise, offers an opportunity to reconnect with your limbs, skin and organs. When traversing the slopes, try to think about all the different processes that are taking place in your body, enabling you to move in such a remarkable way. Think about your body’s conversion of food into energy, the intricacies of your respiratory system and the signals sent between your brain and your muscles. Watching footage of world class skiers can also be a great way to appreciate the body in relation to skiing. Pick your favourite skier as a role model for your time on the slopes. In thinking about skiing as a beautiful, exhilarating and relaxing sport, you are likely to come to see it as positive. Remember that everyone on the slope is there to push their bodies to perform as best they can, rather than to judge others’ physical appearances. Far from being a place to worry and criticise yourself, the ski slope can function as a space of freedom and celebration. Away from the stresses of everyday life, the sparsely populated wintry landscape is the perfect place to reconnect with yourself and work on the relationship between your mind and your body.